The provider of about half of the electricity used by Madison’s electric utility customers has concerns about reaching the carbon-dioxide emissions reductions proposed by the EPA earlier this summer. John Knofczynski, engineering manager at Heartland Consumers Power District, offered a presentation on Thursday to fellow members of the municipal Electric Advisory Committee that outlined the challenges one of Madison’s electricity suppliers faces if the current federal proposals remain the same. Knofczynski warned that the current options for meeting a 35-percent reduction of South Dakota’s carbon dioxide emissions would mean a major restructuring of HCPD’s electricity supply and most likely higher costs to consumers. Knofczynski said the EPA had an overall goal to reduce carbon-dioxide emissions across the nation by 30 percent less than 2012 levels. The EPA wants to reach that goal by 2030, but federal officials also have interim target levels that they want the states to reach by 2020. The EPA has proposed that the states use four building blocks in the reduction plans: heat-rate improvements at existing power plants; substituting coal-based electricity with natural gas combined-cycle electricity generation; substituting renewable electricity generation; and demand-side (consumer) energy efficiency measures. Knofczynski said that South Dakota only has one natural gas generation plant currently available, the Deer Creek Station owned by Basin Electric Power Cooperative. He said the Deer Creek Station would need to operate at more than a 70-percent capacity factor to offset generation losses from the coal-fired Big Stone Power Plant. He also said under current EPA policies, electricity providers will not receive any credit for supporting renewable energy production that was active before the carbon-dioxide reduction policies go into effect. Knofczynski told the advisory committee members that the EPA’s building blocks offered little in practical solutions to South Dakota consumers. Whelan Energy Center Unit 2 near Hastings, Neb., which has a 225-megawatt (MW) output from its coal-fired generation plant. HCPD has 35-percent ownership equaling 82 MW; however EPA officials gave Nebraska a 26-percent reduction target. Laramie River Station near Wheatland, Wyo., a three-unit, 1,710-MW coal-fired plant in which HCPD has a 3-percent share equaling 51 MW. Wyoming has a 19-percent reduction target, but Laramie Station is also currently managing a regional haze mandate made by federal officials. Wessington Springs Wind Energy Center in South Dakota, consisting of 34 wind turbines providing 51 MW in total capacity. 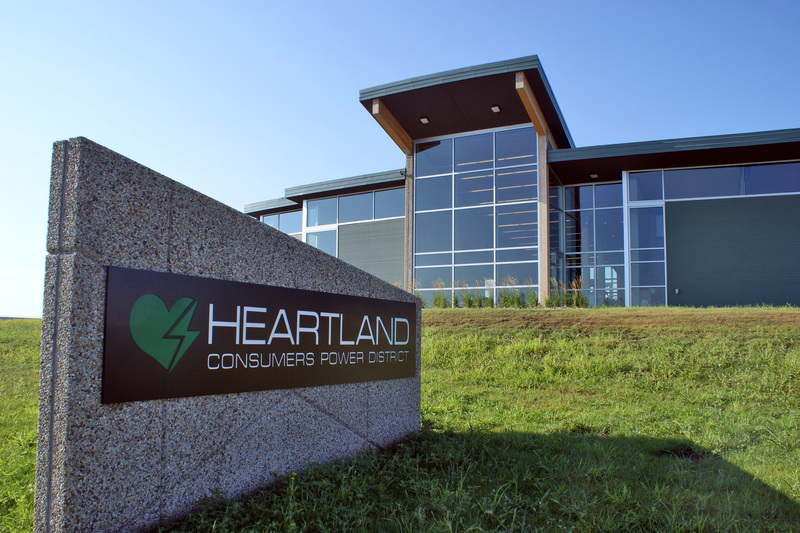 Heartland has purchased the full output from the wind farm since it went into service in February 2009. Persons can send public comments by mail, e-mail or fax with the deadline on Oct. 16. All comments need to include the federal government’s docket ID No. EPA-HQ-OAR-2013-0602 in the message’s subject line. The comments are mailed to Environmental Protection Agency; EPA Docket Center (EPA/DC), Mailcode 28221T, Attn. Docket ID OAR-2013-0602; 1200 Pennsylvania Ave. N.W., Washington, D.C. 20460. Persons can e-mail comments to A-and-R-Docket@epa.gov or fax them to 202-566-9744. On June 2, 2014, the U.S. Environmental Protection Agency released a proposed rule, under Section 111(d) of the Clean Air Act, to reduce carbon dioxide emissions from existing fossil-fueled power plants. EPA hopes to release the final rule in June 2015 and is now accepting comments on the rule and holding public hearings across the country. The proposal goes well beyond what is permissible under the Clean Air Act’s Section 111(d). EPA is mandating specific CO2 reduction requirements for states, which is a problem because the proposed rule provides no role for states in setting or modifying those standards. States know best what they can do. The proposed rule tries to do too much too fast. It is “front-loaded,” requiring most emission reductions by 2020. Coupled with stringent compliance requirements, the 2020 deadline does not give states enough time to come up with plans, have them approved by EPA, and achieve their reductions. EPA claims it offers states “flexibility” but that’s just a myth. In constructing its “building blocks” to determine a state’s reduction requirement, EPA has relied on such aggressive assumptions that its severely limits state compliance options. The building blocks have actually become roadblocks to success. States do not get full credit for actions they took to invest in renewable energy and energy efficiency measures prior to 2012 [see our blog post on early action]. This penalizes states that have been “out in front” on emission reductions. The reduction requirements for some states will force the premature closing of coal and natural gas-fired units, with heavy capital investment, that still have useful lives. And when fossil-fueled plants are shut down prematurely, reliable power supply — and customers’ electric bills — will feel the pain. The state requirements do not take into account the fact that electricity demand is rising, thanks to population growth and an increase in energy-intensive manufacturing. Renewables and energy efficiency measures alone won’t be enough to meet the increasing demand for power. APPA will continue to voice its concerns, submit written comments by the Oct. 16, 2014 deadline, and work to ensure that public power utilities are able to honor their commitment to keep the lights on at affordable prices, while continuing to care for the environment. In response to the Environmental Protection Agency’s proposed rule on carbon dioxide emissions from existing power plants, public power utilities should set up meetings (or continue to meet) with state environmental regulators and other state officials, American Public Power Association (APPA) Director of Environmental Services Theresa Pugh told attendees at APPA’s National Conference. At those meetings, public power officials should discuss their utility and the state-wide reduction targets and what that would mean in terms of electricity costs, additional renewables, and energy efficiency inside the fenceline and outside the fenceline (with customers), she said at the June 17 session. The meetings also should cover the state officials’ ability to meet their obligations administratively by 2016. In discussing what utilities should do now, Pugh also advised them to meet state environmental regulators and state energy officers about operational and potential reliability issues associated with implementation of the proposed rule. She urged utilities to meet with state economic development agencies and local officials to discuss the potential economic impacts for factories and population growth concerns. Utilities should look at what changes in dispatch of generation resources would mean and whether it would prevent a unit from running, Pugh said. If a utility wants to build a natural gas-fired power plant, determine whether it would be permitted, with an eye on the effect on meeting EPA’s nitrogen oxide (NOx) emissions limits, she advised. It isn’t always a slam dunk to replace a coal plant with natural gas units, she noted. Public power utilities also should get involved in the public policy debate over the proposed rule by speaking at EPA public hearings on the proposal, filing comments on the proposed rule with EPA, and helping APPA identify major issues for the association’s comments on the proposed rule, Pugh said. *This article originally appeared in the June 26, 2014 issue of Public Power Daily from APPA. The following Letter to the Editor was recently submitted to the Sioux Falls Argus Leader, the Aberdeen American News and the Brookings Register. The Environmental Protection Agency recently issued regulations for existing power plants. While cutting carbon dioxide (CO2) emissions by 35 percent by 2030 may seem like an admirable goal, at what cost are you willing to achieve this goal? The result of the EPA’s regulations could be more expensive electricity for South Dakotans. While the EPA would like you to believe the proposed cuts would actually lower your electric bills, in reality, these regulations will mean less money in your pocket. At Heartland Consumers Power District, we believe that relying on diverse fuel sources for electric generation is the best way to keep electric bills affordable. We have generated electricity by coal, nuclear, solar panels and wind turbines. We take our responsibility seriously to provide reliable and affordable electricity while doing our best to protect the environment. Each generating source has its place in a reliable portfolio. Each source has its benefits and drawbacks and working together, ensure the lights stay on in homes across South Dakota. Utilities across the state, including Heartland, have implemented energy efficiency programs to help customers save money and use electricity more efficiently. We have also continually updated our plans to ensure they operate at peak performance with minimal impact on the environment. These regulations will cause plants across the country to close, compromising both the reliability and affordability of electricity. Coal will not be the only victim as natural gas plants will also be impacted. We care about the price of electricity because we’re a not-for-profit entity that looks out for our customers and their checkbooks. We’re concerned that the EPA is making a decision that could force an increase in the cost of electricity and erode the reliability of our power supply. What’s at stake? If electricity prices rise, we’re worried that the trickle-down effect could be severe in communities served by Heartland. Higher electricity prices hurt businesses of all types, potentially leading to layoffs, or slower job growth. It is our belief that Congress, not the EPA and the Obama administration, should regulate matters that affect commerce, including the generation of electricity. That’s why we’re encouraging everyone to speak up. Visit http://www.TellEPA.com and tell the EPA that we can’t afford more regulations and higher electric bills.